Clayoquot Sound creates the right combination of habitats to draw over 40 species of shorebirds to the area. Thousands stop here to feed and rest as they make their impressive journey from South and Central America northward to their Arctic breeding grounds. 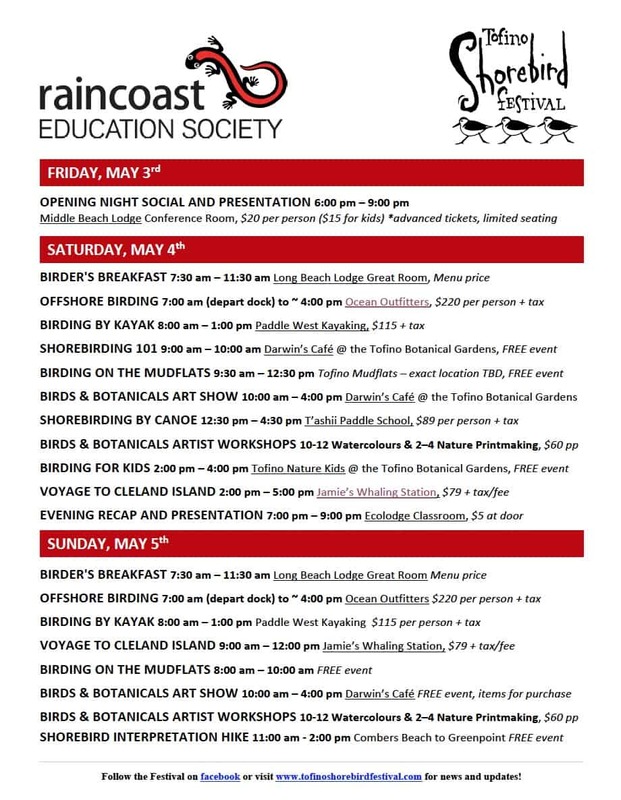 The Tofino Shorebird Festival from May 3-5 celebrates this impressive annual migration with a series of educational birding activities throughout the region. The festival offers guest lectures, birding workshops, boat trips and much more! This is a great opportunity to experience the largest wildlife migration in the region, learn about these impressive birds, and understand why Tofino is one of the very best places in western Canada for bird watching. Follow @TofinoShorebirdFestival on facebook for event reminders, details, and more! Below is the impressive, event-packed 3-day schedule. Print the quick guide here and the full detailed schedule here.